Happy National Park Week, everyone! That's right, it's that time of year when we set aside a full week to appreciate one of America's greatest treasures. (Don't forget that means free admission to any park this coming weekend!) Of course, to many of us, every day is a good day to celebrate our national park system, which protects some of the most famous landmarks in the world. A few of the names—Yosemite, Grand Canyon, Everglades—even evoke the very essence of what we are as a nation. The system reflects the breadth of the United States: its lands, its people, its history, and its culture. Oh yeah, and national parks are home to a ton of birds. Most people think of our national parks as remote destinations requiring a long trip, but there are national parks close to wherever you live. The national park system is composed of 417 distinct sites, covering all 50 states and most of our island territories. There is great birding to be found in most of them, and where there aren’t a lot of birds, you’ll learn something new about our culture or history, so it’s still worth a visit. You can go here to find a park near you, but don’t leave just yet. There’s way more to talk about! First, it helps to know what exactly our national park system entails. While the most famous and popular sites are often the ones designated “National Park”—see: Yosemite or Yellowstone—the majority have other designations. As I outlined in an earlier column on America’s public lands, the national park system also includes National Military Parks, National Battlefields, National Lakeshores, many National Monuments, and a host of other places. Though lots of people intuit that the sites officially called national parks are somehow “better” than those with other designations, it’s not really true—the reason for different designations is complicated, sometimes reflecting slightly different management for the site or just the politics involved. No matter what designation the park has, each is managed by the National Park Service with a mandate to "conserve the scenery and the natural and historic objects and wildlife therein, and to provide for the enjoyment of the same in such manner and by such means as will leave them unimpaired for the enjoyment of future generations." This mandate is important, because it separates national parks from other public lands. For example, lands run by the U.S. Forest Service and Bureau of Land Management are managed partly for public enjoyment, but also for agricultural harvest and mineral development. On the other end of the spectrum, lands in our National Wilderness Preservation System, which spans multiple agencies, are meant to remain “untrammeled by man” rather than for public enjoyment. That makes national parks the best of both worlds for a birder: an area that is managed to protect the natural environment while also providing access to the public. What's most incredible about our national parks is just how much they have to offer in terms of habitat and wildlife diversity. I recently made a list of the Top 25 National Parks for Birding for my day job, as well as a ranked list of all 417 national parks by their number of bird species (only 282 parks have eBird Hotspots, as I learned). The top five parks show just how varied the American landscape is: No. 5, Cape Cod National Seashore, Massachusetts (339 species); No. 4, Death Valley National Park, California (357 species); No. 3, Big Bend National Park, Texas (360 species); No. 2, Gateway National Recreation Area, New Jersey (375 species); No. 1, Point Reyes National Seashore, California (405 species). The parks with the highest species totals weren't all necessarily the ones I expected, either. Five of the top 10 parks were national seashores, which makes sense because most of them contain fresh and saltwater, forest, fields, and various other habitats that attract different kinds of species. Neither the Grand Canyon nor Yellowstone, for all their glory, have coastlines, and so they just won’t ever have as many species as Point Reyes or Cape Hatteras National Seashores. National parks the best of both worlds for a birder: an area that is managed to protect the natural environment while also providing access to the public. Some parks were real surprises. How does a place called Death Valley end up with the fourth most species of any park? It turns out that one location inside the park, a hotel and resort area called Furnace Creek, acts as a true desert oasis. The Furnace Creek hotspot has recorded a staggering 321 species, among the highest species counts for any single hotspot in the country. 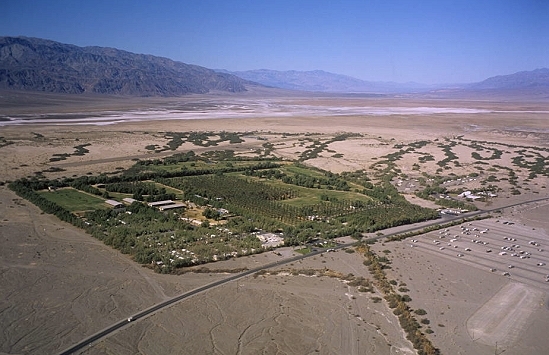 An aerial photo shows you why: the Furnace Creek area is the only green, tree-covered spot for miles around. Birds flying over the desert zero in on Furnace Creek as a place to drink and feed, and birders are there to count them. Other parks jumped out at me for their size. Fort McHenry National Monument and Historic Shrine, and Cabrillo National Monument, numbers 17 and 18 on the list, respectively, are both tiny parks with less than 150 acres each. There are parking lots that big at the Grand Canyon (probably not, but I’m trying to make a point here), and yet both have amazing bird diversity. Their coastal locations are the reason why. Fort McHenry is on the East Coast, in Baltimore, and interprets the history of the War of 1812. Cabrillo National Monument is all the way on the southern tip of the America’s Pacific Coast, in San Diego, and marks the spot of the first European visit to the Pacific Coast in 1582. Both of these parks are on the ends of peninsulas, which can act as staging areas during migration, and also provide great spots for ocean birding. The fact that both of these parks are also connected to major cities means that the “Central Park Effect,” where urban parks attract birds unable to land elsewhere in the concrete jungle, likely helps these parks get more species. Putting these lists together was fun, but I don’t want to give the impression that birders should only go to the parks with the highest species totals. Though their overall species lists might be lower, large national parks like the Grand Canyon and Yellowstone are incredible places to see birds in their natural habitat. I’ve stood in awe and watched California Condors soaring in Pinnacles National Park (they can also be found in the Grand Canyon and Zion National Parks), just as they did for millennia before humans came along. I’ve seen Roseate Spoonbills and thousands of other wading birds hunt through Everglades National Park. I’ve twice snuck along ridges in Rocky Mountain National Park looking (unsuccessfully) for White-tailed Ptarmigan (nemesis bird! ), but they’re there, and I’ll be back. Seeing birds where they actually live, not just as migrants or vagrants, is an essential birding experience. It helps you get to know them as species, not just check-marks. I’ve visited more than 100 national park sites, and submitted eBird checklists for most of those. Visiting national parks has taken me to the far corners of the nation and shown me new birds at each stop, from my first Brown Noddys at Dry Tortugas National Park at the end of the Florida Keys to Kittlitz’s Murrelets swimming at the mouth of a glacier in Kenai Fjords National Park in Alaska. Our national park system really is something special, so be sure to celebrate the parks and the birds they protect this week—as well as every other opportunity you get. Audubon's staffers put together a list of some of our favorite spots for birding and marveling.